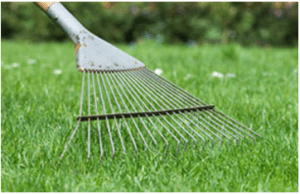 Power Raking is one of the best ways to spruce up your lawn during the spring season. If you have already raked your lawn in the fall to clean up leaves and debris, you may wonder if it’s overkill to rake again in the spring with a power rake. During the winter months, grass blades that die off can become thatch, so the fall workup won’t always prevent your grass from building up grass stems, roots and clippings that prevent water from penetrating to the roots. Although some people prefer to use leaf blowers to remove debris, leaves and dead grass, blowing doesn’t scratch the grass surface the same way that raking does. This is why power raking in the spring can help keep your lawn healthy. If you plan to aerate your lawn, or have holes punched into it to improve the soil, be sure to rake first. Thick thatch layers make aeration less effective and there is little risk that reducing thatch before aeration can harm the lawn. Dethatch several days before aeration to let grass plants recover. Read more and gain some useful information on Power Raking and Raking Tips!